This week's Tuesdays with Dorie (TWD) recipe was the Tart Noire. It's a basic chocolate tart but I'm still at my parents' place and my mom doesn't have a tart pan. Plus, I'd probably have to eat it all by myself (I know, poor me, right?) because my dad's on a cholesterol busting diet and my mom doesn't like anything that is too rich. 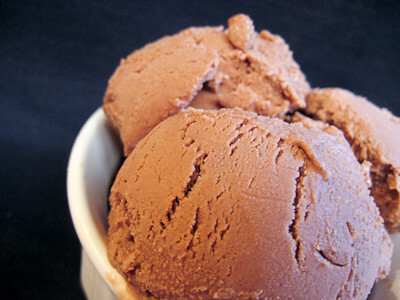 So I bring to you a recipe for something I made some time ago, but never got around to posting - classic chocolate ice cream. I mentioned it when I made the Baby Ruth Ice Cream Pie and now here I am, months later, finally posting the recipe for it. Better late than never, right? Like many of the recipes in David Lebovitz' The Perfect Scoop , this is another custard based ice cream recipe. The egg yolks really give it a rich, creamy chocolate flavor that keeps you going back for more. I promise that if you have never made a custard based ice cream before you just have to try it once before you realize how easy it is! Don't let the egg yolks scare you! Warm 1 cup of the cream with the cocoa powder in a medium saucepan, whisking to thoroughly blend the cocoa. Bring to a boil, then reduce the heat and simmer at a very low boil for 30 seconds, whisking constantly. Remove from the heat and add the chopped chocolate, stirring until smooth. Then stir in the remaining 1 cup cream. Pour the mixture into a large bowl, scraping the saucepan as thoroughly as possible, and set a mesh strainer on top of the bowl. Warm the milk, sugar, and salt in the same saucepan. In a separate medium bowl, whisk together the egg yolk. Slowly pour the warm milk into the egg yolks, whisking constantly, then scrape the warmed egg yolks back into the saucepan. Stir the mixture constantly over the medium heat with a heatproof spatula, scraping the bottom as you stir, until the mixture thickens and coats the spatula (170°F on an instant-read thermometer). Pour the custard through the strainer and stir it into the chocolate mixture until smooth, then stir in the vanilla. Stir until cool over an ice bath. Hmmm - ice cream. Just what we need for these hot summer days. Looks so creamy and delicious. So funny, I made his Milk Chocolate Ice Cream just last night for Corbin. I like yours better because it calls for darker chocolate. Yum. Ahh this looks delicious!! I need to get myself that book! I so have to start making ice cream, your pictures are making me drool!! Great for the summer heat! 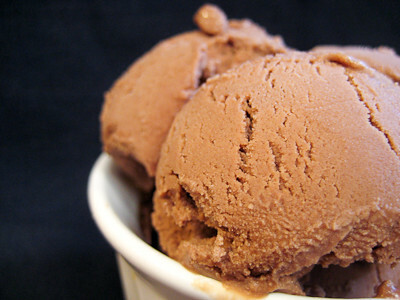 I just finished churning DL's Philly style chocolate ice cream, which is my favorite and absolutely awesome! I like the custard one, too, but just try to cut some of the fat without those yolks. And they are not missed with the Philly recipe. HEAVEN! Both are excellent! Yours looks de-lish! I can't believe I haven't made any ice cream this summer. This is so inspiring! YUM!